With the second highest number of breeding bird species of any park in the lower 48 states, Glacier is a fantastic place to expand your life list while enjoying spectacular scenery and some of the best hiking in the world. This trail guide will help you know what birds to look for and where to find them while leaning about the plants, mammals, geology, human history and ecological context along the way. Fifty-three trails and other locations are described in detail with information covering over 170 bird species. "The book focuses on birds first and foremost, but also covers plants, geology, mammals, basic ecology, and recommendations for what to do in the park, where to do it, and when. Check out the GNP Birds Blog! 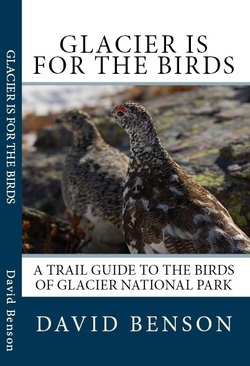 It contains some chapters from the book, updates, and other information about birding in Glacier National Park. ​David Benson started birding in Glacier National Park in 1995 while he was doing his Ph.D. research on White-tailed Ptarmigan at Logan Pass, the highest point along the Going to the Sun road. He received his Ph.D. in Zoology from Washington State University in 1999 with an emphasis on birds and behavior. That summer David got a job as Ranger-naturalist in the Many Glacier area of Glacier National Park. He has been there every summer since, leading hikes and doing bird walks, campfire talks, and a bird slide show program. During the winter he is a tenured Professor of Biology at Marian University in Indianapolis, IN, a position that he has held since 1999. David teaches the outdoor “ologies” like ecology, conservation biology, and ornithology. He is a member of the biology and environmental science programs at Marian and is also the founding Director of a small natural area on the Marian University campus that provides environmental education opportunities for kindergarten – 12th grade inner city youth and others. David’s continuing research on Ptarmigan in Glacier National Park is primarily centered on how ptarmigan are dealing with changing climate.